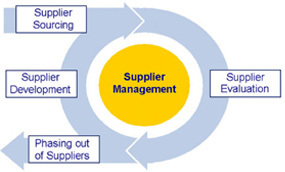 Supplier Management aims at organizing, controlling, and development of supplier relationships. Supplier Management is based on four interlocking modules, through which uniform sourcing, evaluation, classification and development of suppliers is achieved. No record(s) to display now. *For Login into the Portal, use vendor portal User Id, Password. If anyone do not have Id, Password, please contact our vServ call center +916645666777 Vendor Helpdesk Team.